These gentle Aloe Refreshing cleansing Face Wipes are infused with chamomile, cornflower extract Aloe Vera to provide a quick and healthy refresher anytime, anywhere. JustWipesTM Wakeup wipes has a formulation which when inhaled while wiping your face keeps away sleepiness and lethargy. Eucalyptus leaf extract is used in these wipes which leaves the skin tingling and refreshed. If there is a need to wake up or stay alert on the double, then there is a need for JustWipesTM Wakeup wipes. Freshen Up Wipes(24 x 7 Freshen Up wipes) are meant for multi purpose quick clean ups. - Helps in curing rashes. 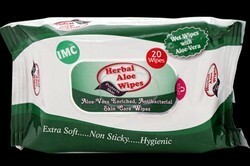 We are deeply involved in offering Herbal Aloe Wipes in damage free packing. 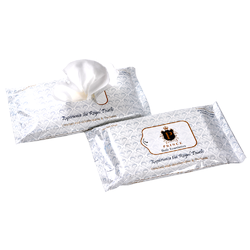 Owing to the presence of our expert team members, we have been able to offer a wide range of Body Wipe. An intensive cleanser suitable for all types of skin. Penetrates deep down and extracts all the traces of dust grim and makeup. Use morning and evening and before makeup to maintain a smooth and radiant complexion. Refreshing wipes with natural Tea Tree Extract. Gently cleanse away make up, excess oil and other impurities, while helping to target blemishes, to leave skin feeling clean and fresh. Perfect for oily skin. International Marketing Corporation Pvt. Ltd.
Love Nature Cleansing Wipes Tea Tree are refreshing wipes with natural Tea Tree Extract. Gently cleanse away make up, excess oil and other impurities, while helping to target blemishes, to leave skin feeling clean and fresh. Perfect for oily skin. This has orange enriched with Vitamin C that restores the natural moisture of your skin.